Enjoy a brand new version of extra cool Japanese logic puzzles - griddlers (nonograms)! The logic it is based on is simple and fun. Simply use the given number keys and unveil the hidden picture. You'll love the splendid interface, the editor for creating new griddlers and the large collection of pre-made black-and-white and colored puzzles. What's more, you can use your own images to create a puzzle for others to solve. ...... A solution errors mode will show your errors while you are tackling the puzzle; special hot keys will assist you with the game; a wrong move can be cancelled. 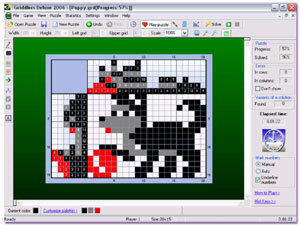 You can choose your own color and style for the puzzle grid. What's more, you can print and solve your chosen puzzle on paper. Smart tips on successful playing will appear every time you enter the game, however if you are still at a loss for a way to succeed in this game, visit our website and read the rules. Apart from that, hundreds of griddlers are available on the game's website, thus playing Griddlers Deluxe now becomes the ultimate pleasure. ReGet Deluxe is a powerful download manager for professional users. Download and play Chuzzle Deluxe for fun as well as developing mental ability! download Typer Shark Deluxe to practise you response ability and typing speed. Brave Dwarves 2 Deluxe offers more episodes than Brave Dwarves 2 to you. Bubble Golden Pack Deluxe will completely bring player into a color bubble world. Qweas is providing links to Griddlers Deluxe 2007-6.3 as a courtesy, and makes no representations regarding Griddlers Deluxe or any other applications or any information related thereto. Any questions, complaints or claims regarding this application Griddlers Deluxe 2007-6.3 must be directed to the appropriate software vendor. You may click the publisher link of Griddlers Deluxe on the top of this page to get more details about the vendor.